PC/104 Motion Controllers - RTD Embedded Technologies, Inc. 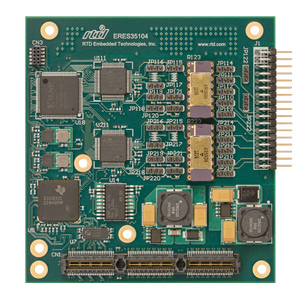 The ERES35104 provides a direct interface to two Synchro/Resolver/Inductosyn/LVDT channels on the compact PC/104 form factor with a stackable PCI Express bus. Both sensor input channels are independently configurable with jumpers. An onboard solid state Scott-T circuitry provides a precision conversion from Synchro to Resolver signals. 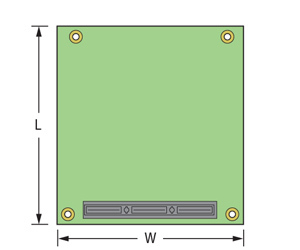 Onboard precision thin-film resistor divider networks for 2.0, 11.8 or 90.0 VRMS configurations. The onboard programmable sine wave oscillator reference outputs a 0 - 7Vrms excitation signal with a programmable frequency range of 1 Hz to 10 kHz. This compact board is capable of interfacing to Inductosyn scales with dedicated preamplifier and signal conditioning boards. Please contact us for more information on dedicated preamplifier and signal conditioning companion boards. You may use the ERES35104 to interface to geared Synchros or Resolvers; connect the high gear channel to one input and the low gear channel to the other. The code conversion can then be performed using a software routine.